Bringing up Bella: In just under the wire: Write a Post, Help a Dog! In just under the wire: Write a Post, Help a Dog! 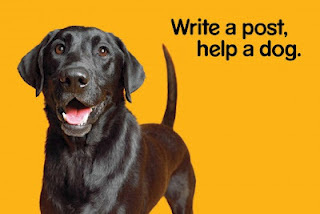 Well, behind as always, I just learned about Pedigree's "Write a post, help a dog" campaign going on through the end of June this year. Yikes! 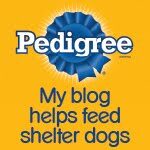 "For every blog post about the campaign between now and June 30th, Pedigree will donate a 17 pound bag of food to a shelter." 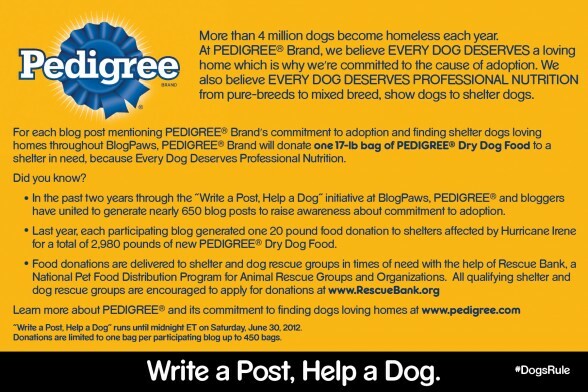 The Pedigree Foundation does a lot of good for shelter dogs. If you have some time, check out their videos here: Adoption Videos. They're far too awesome to miss. And don't forget to check out the other blogs in the hop below. Each of these bloggers took the time to write something up to help shelter dogs. You guys rock! OH wow, I didn't know about it either! I'm always too late. :-( Glad you made it on time, and maybe even got another two bloggers on board by the looks of it. We never even heard of this! Maybe it's a national campaign? We did that too! LOL. We're also glad we got in time. We do hope they feed them hungry dogs. Hey Leslie, you and I have they same feeling about Peanuts. She is indeed cute and has a colorful personality. She's turning into a lady now and that means more shedding... Oh, the dreaded shedding.